Among parents aged 26 to 31 who didn’t graduate from college, 74 percent of the mothers and 70 percent of the fathers had at least one child outside of marriage, Cherlin found. And, 81 percent of births reported by women and 87 percent of births reported by men had occurred to non-college graduates. The study is detailed in “Changing Fertility Regimes and the Transition to Adulthood: Evidence from a Recent Cohort,” a paper by Cherlin, Elizabeth Talbert and Suzumi Yasutake recently presented to the Population Association of America. The researchers mined data from the National Longitudinal Survey of Youth, focusing on a sample of 9,000 “early adults” who reached ages 26 to 31 in 2011. They are the oldest members of the generation commonly known as Millennials. By that age, 53 percent of the women had given birth to at least one child and 64 percent of the mothers had at least one baby when they weren’t married. (Forty-seven percent of the mothers had all of their babies out of wedlock.) The percentage of unwed pregnancies goes up, as the women’s education level declines. The numbers are roughly the same for men. 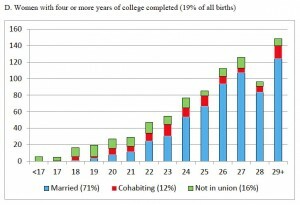 Lastly, among mothers with no high school diploma, 87 percent had at least one baby while unmarried. Only 36 percent of the mothers had all of their babies while married — that’s 46 percent of whites, 10 percent of blacks and 28 percent of Hispanics. Those numbers are roughly the same for men.